So anyway,: Invisibility watch? Really? Frankly I think Doctor Who's adaptation did no justice at all to Pinter's original. "The Caretaker" by Gareth Roberts and Steven Moffat, directed by Paul Murphy. Spoilers after the cut. Yet more Steven Moffat co-writing; is it because there's arc stuff going on this week, or is he still trying to help establish a very different personality for Peter Capaldi's Doctor? Either way I would have thought Gareth Roberts was an experienced enough Who writer to be left to his own devices. Of course he was the writer of the "Lodger" episodes during Matt Smith's tenure, and this is kind of along the same lines, with the Doctor trying to pass himself off as a human in an everyday environment. 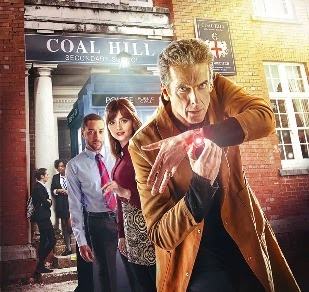 Obviously this would have to be done quite differently now as Twelve is a very different Doctor to Eleven, and while the episode's all right I'm starting to be a bit concerned about the portrayal - not by Capaldi so much as the overall portrayal with the way he's being written and how the actor's interpreting that. One of the things that was apparent about Eleven very early on was that he was one of the most obviously "alien" Doctors, in the same way that Four was, and for the same reason - that Matt Smith, like Tom Baker, comes across as quite eccentric in real life. Twelve's alien nature seems to have been built up in the writing rather than the performance, and so it feels a bit forced. So an episode dealing almost exclusively with this inability to blend in with humans was one I found hard to warm to.